India’s first indigenously built engineless semi-high speed train, Train 18, has been named Vande Bharat Express, Union Minister Piyush Goyal announced on Sunday. The train is set to run between Delhi and Varanasi at a maximum speed of 160 kmph and will soon be flagged off by Prime Minister Narendra Modi. 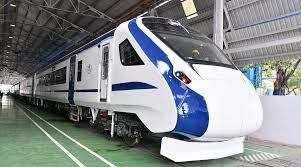 the general public but we have decided to name it Vande Bharat Express. A gift on the occasion of the Republic Day to people. Will request the prime minister to flag it off,” Goyal said. The 16-coach train, built in 18 months at a cost of Rs 97 crore by the Modern Coach Factory, Rae Bareli, is regarded as a successor to the 30-year-old Shatabdi Express. It’s also the first locomotive-less train in the country. Train 18 got a regular clearance of the Electrical Inspector to the Government (EIG), barely 24 hours after the same office accorded a “provisional” three-month clearance with riders. Within hours, the Chief Commissioner of Railway Safety SK Pathak finally accorded the mandatory safety clearance to the train making it fit for commercial operations. The swanky features of the much-anticipated train include modern air-conditioned coaches, touch-free automatic doors inside the passengers compartment and GPS-enabled passenger information system, showing train speed, location, time to reach destination etc. It will also feature onboard uninterrupted Wifi and infotainment system. The train is designed in such a way that passengers can have a look at the driver’s cabin and also has disabled-friendly toilets. The aircraft-like toilets are bio-vacuum for efficient flushing.